Hope everyone had a wonderful holiday. My hubby gave me the House Mouse digi collection from Joanna Sheen for Christmas. It has 3 CD's filled with colored and black/white HM digis. It's lots of fun to work with. I am running low on birthday cards so I picked this adorable birthday digi to make my card. Cut out the card base with a svg file from The Cutting Café using my Silhouette Cameo. Cut out the house mouse image with my new Nestabilities die set (another gift from hubby). Also used bakers twine and Snips and Snails paper from Doodlebug. Valentines and birthday is right around the corner so this is something I think I would really love even though I can't use with my Mac I could use with my husbands laptop PC. Darling darling card all the way around. So glad you have posted... I've missed you blogging. So sweet - I love these little mice. Doesn't that icing look delicious!! 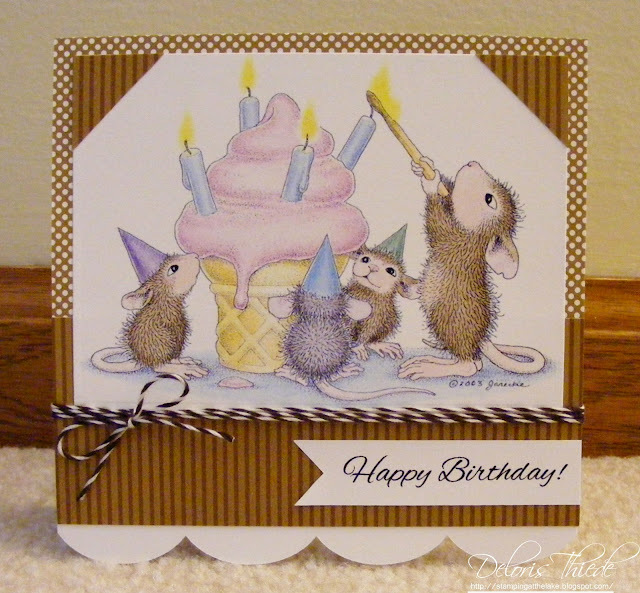 Such a sweet House Mouse image. Great card and coloring, Deloris. Thanks for linking up with us at the Sister Act Challenge Blog. Best wishes for a Happy New Year. Love this sweet card and the brown DPs and twine. Wishing you a fabulous 2014. Super cute card! Thanks so much for sharing your talents with us at Papertake Weekly, and hope you join us again soon!